One of the world's favorite dive knives is in Damascus! It our 40th Anniversary special edition. Only 19 made! 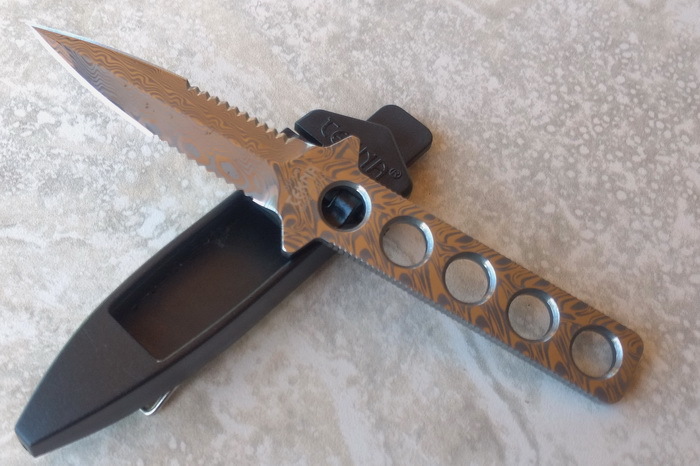 TEKNA Damasteel Limited Edition DIVE KNIFE. The TEKNA Ocean Edge Dive Knife has always been a favorite among divers because of its versatile design and solid, one-piece construction. Now available in Damasteel STAINLESS STEEL Damascus pattern exotic steel, forged from multiple layers (over 100) of RWL34™ and PMC27™ stainless steel in beautiful patterns. Carefully crafted by experienced blademakers in Italy. The Ocean Edge Damasteel® Limited Edition features a symmetrical (dagger-type) blade.